In 1993 the first italian website was published and the government introduced the crime of computer fraud. The Internet boom was supported by all the platforms that were being born in the following years like Google, Napster, Ebay, YouTube and many more. In 2007 broadband connections in Italy reached 20 million users for the first time, in 2008 the user rate growth increased of +1000% (!) thanks also to the “Italian boom” of Facebook, in 2011 more than 50% of the population use Internet. 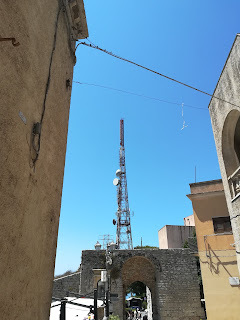 The broadband connections are managed by the ISPs, in Italy the mainly are TIM, Vodafone, Wind Tre, Fastweb. As the picture show, in 2018 67.6% of the territory had broadband Internet (considered connections until 100 Mbps), 14.8% had ultra-broadband Internet. Exactly 52.8% had an internet connection until 30 Mbps and 14.8% until 100 Mbps. While for the current year (2019) Italy has planned to reach 35.7% of the population with ultra-broadband connections and overall the 81.4% of the population with any kind of broadband connection. Why Italy have a slower growth (than the EU average) of its broadband infrastructures? In Italy, the coverage by broadband technology is nowadays quite good compared to the previous years when the principal issues were (and are also today). The fact that the majority of the territories are rural and mountainous (because of Alps and Appennines) called “white areas” because until today it has been almost impossible to install infrastructures and probably it will be for others 3 years, one of the main reasons why Italy has a slower time than other countries to improve its broadband. Because of the economic crisis: Italy's macroeconomic scenario is definitely negative, Italy has always shown a real GDP growth rate lower than the European average over the years, but since 2010 the gap has widened, not being able to afford significant investments. In fact to the “Worldwide broadband speed league” of 2018 Italy ranked in the 43th place, with an average speed of 15.10 Mbps. The current situation of the ultra-broadband is the next. In 2014 with the reports published by the European Commission about the “Digital Agenda” plan Italy has scored the worst penetration rate of fixed broadband among all the EU countries, the coverage of connections with more of 30 Mbps was only 21% and the penetration rate less than 1%! The 95% of the broadband connection were copper broadband, dropped to 65% in June 2018 (according to AGCOM, ”Autorità per le garanzie nelle comunicazioni”). In the same period, 2014-2018, the FTTC connections are increased of 5 million units, FTTH’s of 400 thousands units and FWA’s of 650 thousands units, thanks to about 6.5 billion Euros invested by all the ISPs. Actually TIM is the main Internet provider with the 44.7% of market share, followed by Vodafone, Fastweb and Wind Tre with shares among 14-15%. The Italian strategy for NGA (next generation access) network aims at developing a high-speed access network to maximise the take-up of an infrastructure able to guarantee services above 100 Mbps and to ensure the availability of services above 30 Mbps for all by 2020. Italy’s national ultra-broadband plan, the Strategy for next generation access network (Strategia Nazionale per la Banda Ultra-Larga, SNBUL), was approved by the Council of Ministers in March 2015 with a budget of 6 billion Euros, to promote the infrastructure installation in all the kinds of territories, specially the places that ISPs avoided due to territorial difficulties and so high costs. For this reason the overall territory has been divided in three types of areas: -White areas: areas where there aren’t any infrastructures for the ultra-broadband, so the State will help financially the ISPs to implement them services in these areas -Grey areas: where it’s available only one ultra-broadband Internet provider and so the government try to encourage other ISPs to install them networks. -Black areas: where work or will work at least two ISPs and there’s a fair competition. About development of mobile broadband, we can start talking of mobile broadband in Italy since 1992 when SIP (now TIM) has been authorized for the commercial start-up of the GSM service (the second generation mobile network, 2G), followed by the UMTS (third generation, 3G) introduced in 2005, HSDPA (considered as 3.5G) in 2007 than the actual LTE (4G) since 2011. In 2018, the SIM cards that have connected to the internet at least once are 54 million (registering + 3.5% on an annual basis) with an average data consumption of 3,63 Gb/month (+54.7%). TIM 4G coverage has reached 98.2% of the population (2018), followed by other providers like Vodafone, Tre and Wind. 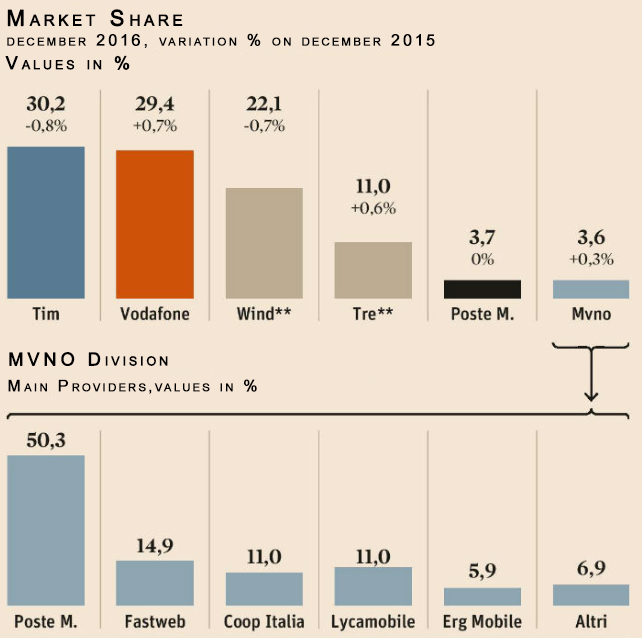 ISPs market division in Italy: TIM confirms its leadership also in the mobile market but with a small advantage on Vodafone. Trying to be ready for the future generation of connections, a 5G trial was launched in March 2017 to implement infrastructures and services in 5 cities: the metropolitan area of Milan, Prato, L’Aquila, Bari and Matera. We analyze international broadband evolution (here, the Italian case) in this blog, in Research Group about Digital Journalism and Marketing and Broadband and in Research Group on Innovative Monetization Systems of Digital Journalism, Marketing and Tourism (SIMPED), from CECABLE, Escola Universitària Mediterrani of UdG, UPF and Blanquerna-URL, in Twitter (@CECABLEresearch), Google+, in the group of LinkedIn, in the page of LinkedIn, in the group of Facebook, in Instagram (CECABLE), in Pinterest and in this blog. We will go in deep in the XXIV Cable and Broadband Catalonia Congress (9-10 April 2019, Barcelona). Buen articulo, con una visión correcta de las conexiones internacionales, son el futuro. Felicidades. Molt bon article doctor, el seu punt de vista sobre les connexions internacionals és molt interessant. Moltes gràcies pel teu comentari, Irene! Un gran article Doctor Fondevila , les connexions internacionals avui dia són molt imporants. Amazing article doctor. The international connections have to work well for the correct exchange of information between countries. Un article molt interessant Dr. Fondevila! Es un article molt interessant, ja que demostra la importancia del cable fora d’Espanya, en un país que té una situació semblant a la nostra com és Itàlia. Molt bon article Dr. Fondevila on es demostra la importància de les connexions internacionals avui en dia. Felicitats per l’article Joan Francesc, dóna una visió de l’important que són les connexions internacionals de cara al màrqueting. Estic molt d’acord amb la importància del cable i les connexions internacionals, amés Itàlia és un cas bastant semblant al d’Espanya. Buen articulo, nos hace ver perfectamente como son las conexiones internacionales hoy en día! Moltes gràcies pel teu comentari, Aura!!! The analysis of the importance of international connections is truly amazing!